CLEARWATER, Fla. - More than half of the room had heard this before. As the team convened for its first full-squad practice yesterday, Phillies manager Charlie Manuel reprised the speech he made when pitchers and catchers reported Thursday. The theme: Winning from the beginning. A pair of 10-14 Aprils hurt the Phillies' chances in the last two National League wild-card races. With 20 of the Phillies' 26 games in April against NL East foes, the division-title race easily could be lost in the first month. "For once, I want to come out of the gate with some positive momentum," Manuel said. "We didn't have enough there at the end to stay there and win." Part of the problem, Manuel said, was shoddy fundamentals. Yesterday, under the gaze of a revamped coaching staff, players who made mistakes in drills repeated the drill until they did it well. "I'm not punishing anybody, but we want things done right," Manuel said. "When somebody messes up, they'll stay out there and do it right." About 10 days into spring-training games last year, Manuel convened an impromptu team meeting in the leftfield corner of Bright House Networks Field and hollered at his players because they were playing lazy, fundamentally unsound baseball - which continued through the spring and into the first half of the season. This year, he's trying to kill that weed before it grows. "Am I glad Zito's in San Francisco instead of New York? Definitely. He wins . . . To put him on that staff, we'd have to think a little harder about thinking we're the team to beat." 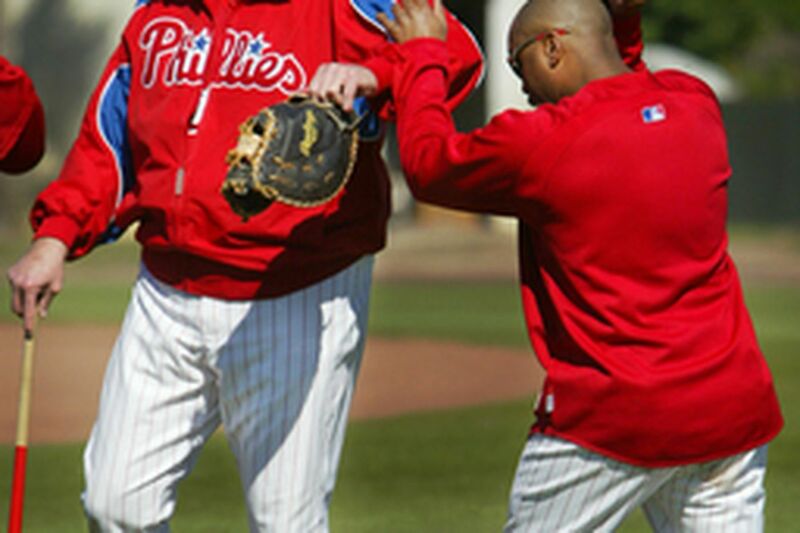 Third-base coach Steve Smith again worked hands-on on fielding fundamentals with first baseman Ryan Howard, a gifted athlete with flawed fielding mechanics . . . Outfielder Jayson Werth, who fought a wrist injury the past 2 years, looked spectacular in batting practice . . . Pitchers will throw live batting practice today . . . After the regular practice session, bench coach Jimy Williams worked on small-ball basics with speedy outfield prospects Michael Bourn, Chris Roberson and Greg Golson . . . Charlie Manuel said he was impressed with righthander Joe Bisenius, a 24-year-old reliever who is expected to start at Triple A . . . Minor league infielder Danny Sandoval remains in Venezuela, trapped in visa limbo.